House and time at Malvern: No 5, 1896 - 1900. Died: 09 May 1915 aged 34 in Belgium. Killed in action at Aubers Ridge. Son of George Eden Hunt and Mrs. Eden Hunt, of 144, Coleherne Court, South Kensington, London and Wadenhoe, Northants. B. December 10, 1881. Modern IV—Lower Modern I. XL Football; Ledbury Cap. Northamptonshire Regt. 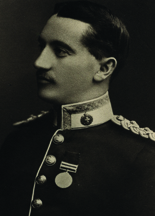 (from Militia) 1903; Captain 1912; served with 3rd Battalion in South African War 1902, Queen's Medal and 2 Clasps. On 16th Sept 1914 he was badly wounded in the back at the Battle of Aisne, during the afternoon, by a shell splinter, and sent home. "During this day [Aisne, 16 Sep 1914] we had still another severe loss amongst the officers, as poor "Mother" Hunt (Captain Ward Hunt) was badly wounded in the back during the afternoon by a shell splinter. One of the very best, I had known him intimately for several years with the 2nd Battalion when I was attached to it in 1910, and at the Depot when he was doing duty there. One of the world's most cheery souls, with a heart of gold, "Mother" was popular wherever he went." (2Lt EJ Needham's account). On 25 Feb 1915 he returned to France, and on 9th May led an attack against German trenches at the Battle of Aubers Ridge, and although badly wounded he carried on and was killed. "The poor old boy went out again to the 58th in 1915 and was killed at Aubers Ridge on the fatal 9th May. A very great little gentleman and a really good friend." (2Lt EJ Needham's account). In The Battle of Aubers Ridge, 9th May 1915, the 2/Northants were in the Northern Pincer movement, and had 426 casualties that day, of which 12 were officers. More than 11,000 British casualties were sustained on 9 May 1915, the vast majority within yards of their own front-line trench.